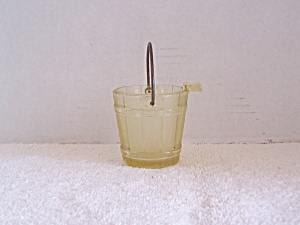 Yellow glass pail or bucket ash tray, with a metal handle. The ash tray has a rough finish with lines showing the slats of the wood-like bucket. The ash tray measures 2 ¼ in. tall (without the handle) and 2 1/8 in. top dia. Shipping weight is 10 oz.